As the boys walked home to dinner, the impatient Gogs did all he could to get Titch to explain his idea, but he refused, saying that he would reveal it only at the meeting. Gogs thought that his mother had never taken so long to prepare his dinner, and during the meal his appetite was only a meagre shadow of its usual enormous self. He could not get his meal over quickly enough. He abandoned his usual procedure of calling on Miff and Smudgie first, but made his way straight to Titch’s house. He was asked in by Mrs Bolton. To Gogs’ great disappointment Titch was still eating his dinner. Gogs looked on with great admiration as his friend calmly finished his pudding. He wondered how anyone could look so cool and collected when containing so great a secret. Gogs was almost bursting with anxiety, but with Mrs Bolton and Titch’s older brother and sister in the room he knew he dare not breathe a word about the matter. After what seemed like hours to Gogs, Titch put on his jacket and, going to a bookcase in the corner of the room, took out a large red volume which he succeeded in cramming inside his coat. “S’long all!” echoed Gogs as he exploded through the door. This morsel of information only heaped fuel onto the already fiercely burning fire of Gog’s curiosity, but, despite further questioning, Titch was adamant. He would reveal nothing more until the meeting started. After calling for their two friends they made their way for the second time that day to Bunny’s house. They found him getting in some bowling practice with a tennis ball by bowling at three cricket stumps placed against a wall at the side of his house. Shouting to them to go on over to the greenhouse, he collected the stumps and ball and soon joined them. “Do we all have to give the secret knock and password?” asked Miff. The boys made their way inside, Bunny threw the stumps in one corner, and each boy made himself as comfortable as possible on the improvised seats available. 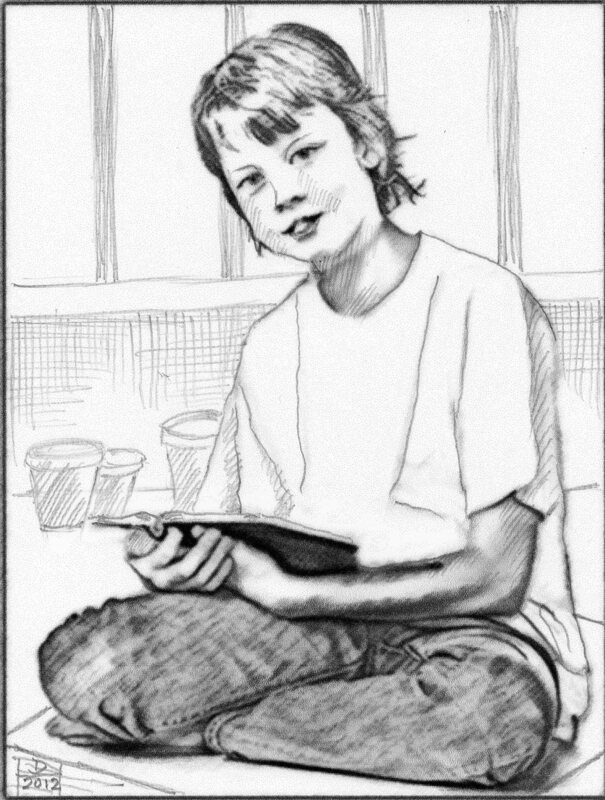 Titch immediately drew out his large red book, lay down on an old potato sack and, propping the book up in front of him, got down to business. “Cool idea!” exclaimed Gogs jumping up again and flapping his hands about until pulled down unceremoniously by Smudgie. “Makes sense,” added Titch. “In my book it says we have to vote. If you agree just put your hand up.” Five hands shot up. Titch wrote down the name on a new page of his notebook. Having done this he turned to the centre of his book and tore out two pages which he ripped into a number of small rectangles. He handed a few to each boy. “What do we do?” asked Smudgie. “Let’s call him Chief,” said Bunny. “I think it sounds more like a secret society.” The others agreed. There was silence for a few moments broken only by the occasional scribble of a pencil. Then Titch announced: “Now fold them up and put them in this pot.” The pot was handed around the circle and then back to Titch who took out the papers, unfolded them and read out the result. The others clapped their hands at this as they always looked to Titch for a lead in all things. Gogs once more stood up and waved his fist in the air until pulled down by Smudgie. “Now we must have a secretary,” said Titch. Another period of silence followed, the papers were collected and amidst more general applause, and flapping by Gogs, Bunny was pronounced Secretary. Again they went through the same procedure for the post of treasurer and by two votes to three Smudgie was elected. Suddenly Gogs flopped onto his stone seat and looked miserably around the circle. The others looked doubtful and Titch frowned thoughtfully. It was Bunny who saved the situation. “Wicked! You’re a real brick Bunny,” exclaimed Miff appreciatively. “That’s jolly good of you,” added Titch with a broad smile. “Oh, good! What do we do next?” asked Gogs, his enthusiasm having been revived by Bunny’s generous offer. “Yes, what rules’ll we have?” enthused Gogs. “How can a word be useful?” asked Smudgie. The others agreed that a secret knock would also be most useful and for the next few minutes nothing could be heard but a barrage of tapping with various stones. After considerable argument about the merits of the various knocks suggested, the five decided to adopt the one suggested by Bunny. The others listened as Bunny demonstrated. He gave one knock followed by a silent count of two, then three more knocks in quick succession, another silent count of two, and one final knock. This was practised by all five for a few moments to make sure they had it right, and then Titch handed his notebook over to Bunny, as Secretary, to write down the secret knock. “How about influenza?” suggested Miff. “Don’t be daft, that’s a disease,” said Smudgie with a look of disgust. “Yes . . .that’s not bad. In fact it sounds really good,” said Titch. “Fancy old Gogs thinking up a big word like that,” said Smudgie in surprise. When he’d finished writing, Bunny asked Titch to look at his notebook in case he’d made any mistakes. Then he handed the notebook to Titch for his inspection. The others agreed most emphatically that their rules should be kept absolutely secret. They would tell no one. A friend of mine recently asked whether I had a photograph of the Swan Inn, Freehold Land, Pontnewynydd. He wants one for his father who actually does have a photograph of the Swan but there are so many people standing outside it that the building itself can scarcely be seen. He tells me that the building no longer exists. So if any visitor who lives, or used to live, in the Freehold Land or George Street area has a photograph of the Swan Inn I should be delighted to hear from them. If no photograph is available it would be helpful to know where the inn used to be. If you are under the impression that vandalism is something new you might like to know that this is far from being the case. In late October 1934 some knuckle-head went in for some widespread vandalism in Pontypool town centre, namely George Street and Commercial Street. Using a glass cutter, the person or persons concerned slashed a 200 yard stretch of shop windows. After my earlier posting about the nine people who were drowned in the Glyn Ponds, you might like to hear about someone from Pontypool who was rescued from drowning. Miss Marjorie Jones, aged 19, lived in Fowler Street, Pontypool and, like so many people in those days, decided to go for a swim in Barry. The day was Saturday, 10th September 1932. While swimming in the sea she got into difficulties and was in danger of drowning. Fortunately, on that same day, and only 50 yards away the Barry Amateur Swimming Club, which had been formed just six years earlier, were holding their gala. On being alerted to Miss Jones’s plight, some men left the gala, dived into the sea and rescued her. “How do we do it Titch? How do we do it?” yelled Gogs warming to the idea. “How cool is that?” exclaimed Miff giving Titch a hearty slap on the back. “Wizard idea!” added Gogs suddenly realising the possibilities of Titch’s suggestion. “Yes, I hadn’t thought of that,” said Smudgie dismally. “When can we do it?” asked Gogs. Bright and early on Monday morning the other four descended on Titch’s house. Gogs, of course, was first, but the others soon followed. They were all delighted when Titch told them that the book had arrived and that it was full of all sorts of useful information. But he refused to say anything else until they had their meeting. They climbed the steep hill in record time, their noise putting to flight a large group of seagulls resting on the tower. Sitting in a semi-circle on the large stones, they all faced Titch as he drew the book out of his pocket. 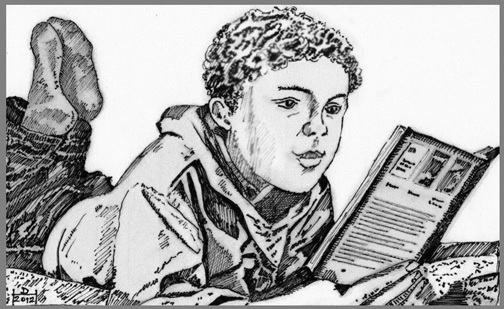 The very sight of the book overcame Gogs as he jumped to his feet and stared at the book over Titch’s shoulder. 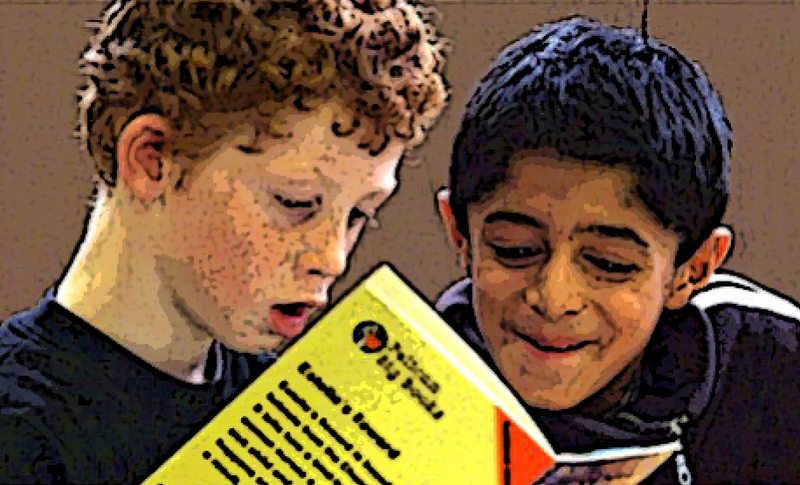 He was enthralled as Titch began to read. “I didn’t say selecting, I said electing,” replied Titch. “Will we have uniforms like in the army?” queried Gogs who was now really worked up to a high state of excitement. “How do we know who’s going to do all these things?” asked Smudgie. “Just like voting for councillors,” added Bunny. On Thursday 23rd July 1868 there was a dreadful calamity causing a large loss of life when nine people were drowned. Three families were visiting the ponds when fourteen of them decided to take a trip on the water while the rest stayed on the bank. All went well until they were returning to the shore; suddenly, when not many yards away from the bank, the boat struck one of the stakes protruding from the bottom of the pond, making a large hole in the side and allowing the water to rush in. Stuffing a large shawl into the hole to stop the water did not work. The screams of the ladies on board as the boat sank alerted those waiting on the bank. Other passers-by on the shore joined in the rescue. Some young men plunged into the water. One of them, Oliver Evans, struck his head against one of the piles and sustained a bad cut. He was later taken to the Full Moon inn where he was given a bed. Some of the children and others were passed to the rescuers from the shore. In this way five of the fourteen who had been on the boat were rescued. At that time Thursday was the early closing day for the shopkeepers of Pontypool but because it was well before cars became popular, there would have been a lot of people walking in and around the town centre, chatting in groups and attending various functions. It was about 9.00p.m. when the light was fading that the news suddenly spread that Miss Essex, the well known eldest daughter of James Essex, had been drowned in the Glyn Pond. Soon afterwards, further tragic news broke about the drowning of others on the boat including several members of the family of Mr E.B.Edwards, the clerk to the magistrates. Crowds of people left the town centre and made their way towards the pond some two miles away. By the time they arrived it was absolutely dark, not even any moonlight. Some people who had been on the bank when the tragedy had happened confirmed the fact that nine people had drowned, one of them being the boatkeeper who lived in a small cottage on the bank of the pond. Despite the hazardous conditions within the pond, such as projecting piles and stakes projecting from the bottom, a party of men had gone out in another boat to try to find the victims of the disaster. These brave souls were: William Bird. Thomas Jenkins, Oliver Evans, George Joshua, Edmund Evans, Charles Redman and Jonathan Cooke. One by one they discovered the bodies which were carried to the boatkeeper’s cottage. They were identified as: Eleanor Essex, Miss James, daughter of Rev Dr James, Rector of Panteg, Janet Sloper, Fanny Ion of Abersychan, Campbell Edwards, Kate Edwards, Jessie Edwards, Granville Edwards and Luke Sanger the boatman. All the bodies were taken to the Sangers’ cottage. The survivors were: J.F.Hiron, James Rowland Essex, Stanley Essex, George Edwards and a 12 year old girl Constance Sloper. The inquest into the tragedy was held in Pontypool Town Hall under the Coroner Mr E.D.Batt. The only witness called was Mr James Rowland Essex. The jury returned a verdict of “accidentally drowned” and added a recommendation that, if the boat were to be used in future, it should be provided with buoys and other life-saving equipment. The other recommendation was that the posts in the bottom of the pond should not be longer than 15 inches. I’ve been living in my house at The Moorings, Newport for over 46 years. The name suggests some boating connection and, on the original plan for the houses, the open drainage ditch – called in South Wales a reen – in the field just outside my back gate was scheduled to be widened to make room for a landing stage with access to the River Usk which is just 600 yards away. Alas, all this never happened and the reen remained in its original state. There must be about 10 acres of fields between the bottom of my garden and the river and until about 10 years ago, we were accustomed to seeing the farmer making hay, and various animals such as sheep, cows and horses roaming there from time to time. The Caerleon valley and the distant hills made it a very rural setting. It was a genuine “panoramic view”. The trains passing by some half a mile away looked like toys. fields and obliterate both the railway line and the River Usk. The fields in question were a flood plain and, from time to time, with the spring tides and a following wind, the fields were flooded. This fact didn’t cause us any concern as the fields were some 20 feet or more below the level of the house. About ten years ago approximately 100 houses were built in the fields and as a result I noticed the build up of water right at the bottom of my garden. I’d always wanted a garden pond so I just dug a large hole and let nature do the rest. As a result I now have a fair sized natural pond on the left side of the garden stocked with goldfish and other varieties all living happily together. On the right is a shallower pond which is the home of many frogs and toads. A week ago I looked out of my lounge window and noticed that the second pond looked as though it was boiling. I went down and, yes, there they were, the usual large collection of frogs jumping and swimming about and making huge clumps of frog-pawn. It’s a sort of annual frogs’ convention and I have no idea where they all come from, unless they spend the rest of their time well hidden in my garden. I counted 62 frogs and there were probably a similar number hidden in the reeds or below the water. One small area of the pond was so full of frogs that it looked like a rugby scrum so I took a photograph which I show below. All this reminded me of the times when, at this time of year a few of my friends and I would take our jam jars with string tied around the tops and our fishing nets, and go on a trip to hunt “taddies” and usually to collect some spawn as well. We had several favourite places to do this. One of the most popular was Pontypool Park lake. It was very large and we were certain to find tadpoles and spawn within easy reach of the pathway skirting the pond. Another favourite spot was the canal basin. The water was fairly wide at that point and a good haul of “taddies” was assured together with huge clumps of spawn. The Fish Ponds just off the Crumlin Road was another haunt of ours. These offered plenty of water but access to them from a convenient spot on the banks was not as convenient because in some places the banks were steep and were overgrown with ferns. Sometimes we would return home with some jam jars containing frog spawn and some containing tadpoles, together with a few bits of pond plants as food for our captives. We would then have a good look at them every day to watch their progress. Some of the spawn hatched out into “taddies” and a few of the tadpoles started to grow legs and turn into frogs which caused us a great deal of satisfaction. On some occasions we had lessons in school about frogs to which we always gave our undivided attention. 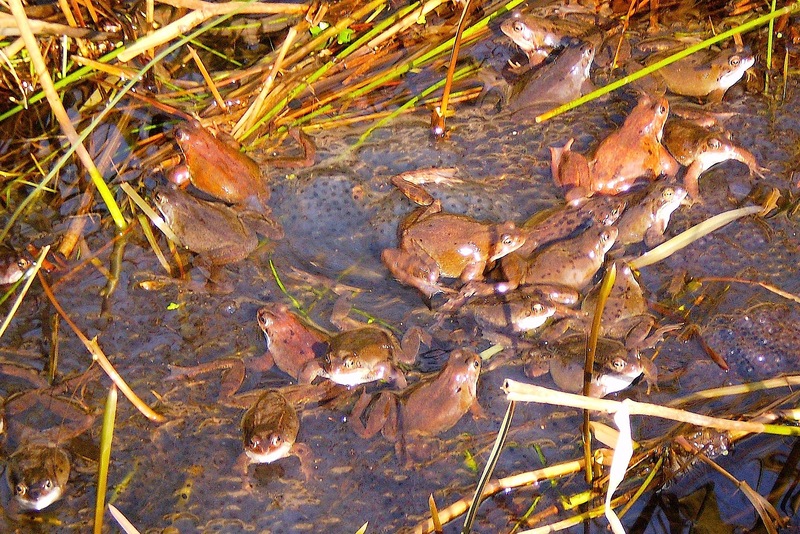 However, none of us had a garden pond in which to place our frogs and “taddies” se we usually ended up returning the survivors to the place where we found them. Although the boys had agreed to meet at 10 o’clock, Gogs, in a high state of excitement because of the forthcoming meeting, started to call on his friends shortly after nine, and by half past nine had succeeded in collecting Miff and Smudgie together. These three boys, who all lived in the same street, then walked around the block of houses to call for Titch. On walking round to the back door of the house they found Titch sitting in a chair on the lawn writing in a small notebook. His thoughtful, frowning expression changed to a broad grin at the arrival of his friends. “Oh good!” he exclaimed. “I was hoping you’d be early.” He rose quickly out of the chair and ran to the back door of the house to tell his mother he was going. Then, ramming the notebook and pencil into the pocket of his jacket, he joined his companions, and the four of them made their way down to the coast road. When they arrived at Bunny’s house they found him examining a large pegged out rectangle of earth which had been prepared the day before in readiness for the erection of the new shed. 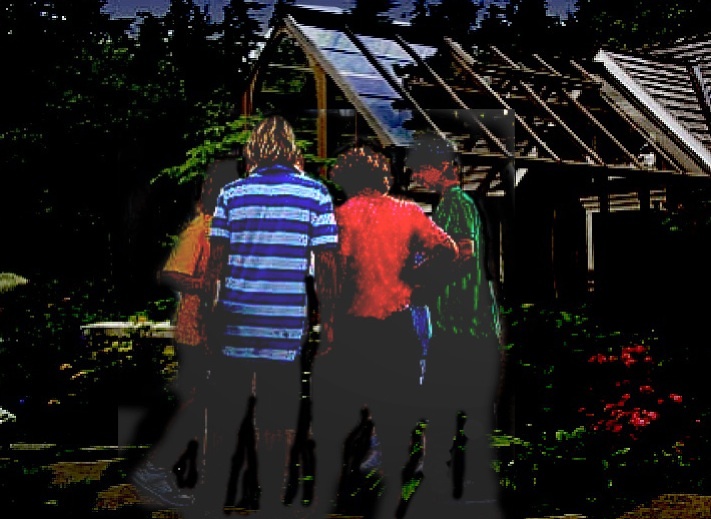 “Hi boys!” he called as he came over to join them by the greenhouse. The five of them were soon inside seated on boxes and various large upturned earthenware pots. 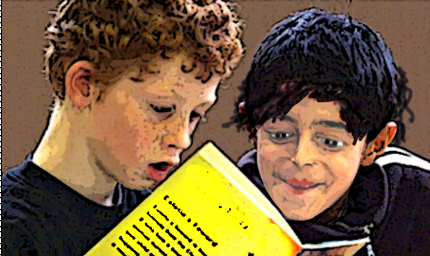 “Yes, read out what you’ve written in your book, Titch,” said Gogs becoming very enthusiastic about the matter. “Right,” replied Titch. “I’ll read out the main facts. You can all listen to see whether I’ve missed anything out.” Titch’s freckled face took on a business-like frown and he began to read. “Bet it’s full of spelling mistakes,” claimed Smudgie. “You wouldn’t be able to tell anyway,” returned Miff defending Titch’s talent. “How will that help?” asked Smudgie. “Dirty kid killers!” snarled Bunny in disgust. “You weren’t one of their customers were you Gogs?” teased Miff. “You mean we’ll have to investigate?” queried Bunny. I have visited West Mon several times over the last ten years and the last time I was there I took a few photographs. Some things had hardly changed a lot whereas there has been great changes in other places. As I know there are some old Westmonians living far away from Pontypool, some in lands far away, I thought they, and possibly others, might like to see what West Mon looks like on the inside today. This is the main hall, and, what luxury, chairs to sit on! In the 1940s every day 400 boys would stand in the hall for assembly, and not a word from anyone. 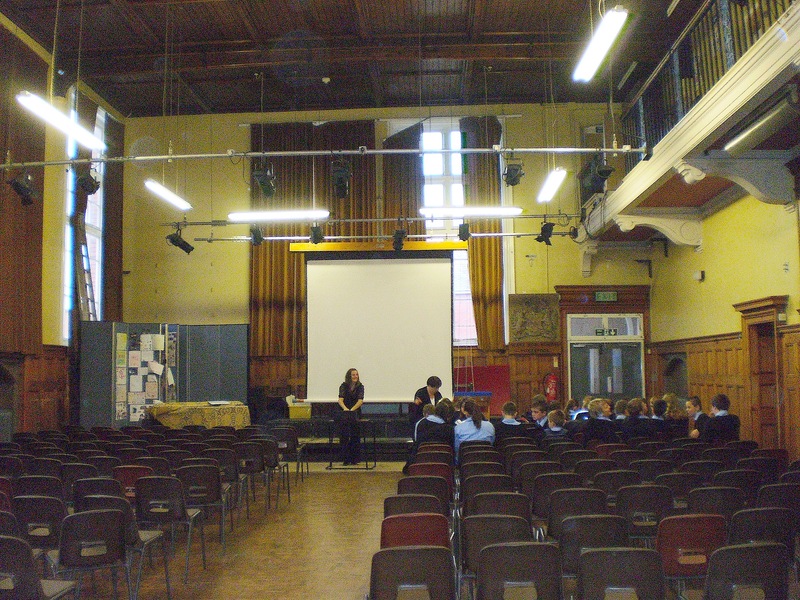 We kept a narrow aisle down the centre ready for the entry of the headmaster R.S.Harrison when we were all assembled. The one thing that old boys will notice is the absence of the stage which has now been completely removed. That was where all the staff, suitably gowned, would sit during assembly. Incidentally, those peculiar creatures with the long hair are called “girls” and are now allowed into this hallowed place !! 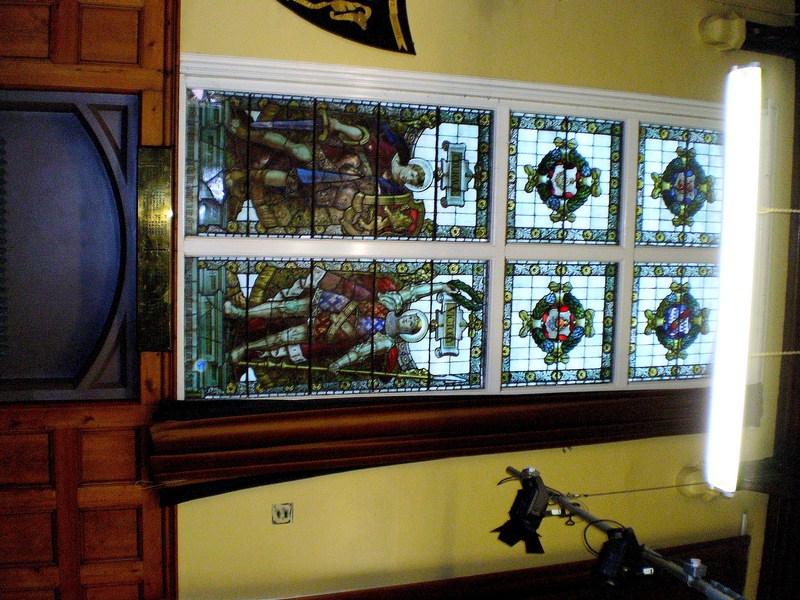 This is the Memorial Window that all old Westmonians will certainly remember. This is one of the things that has not changed. 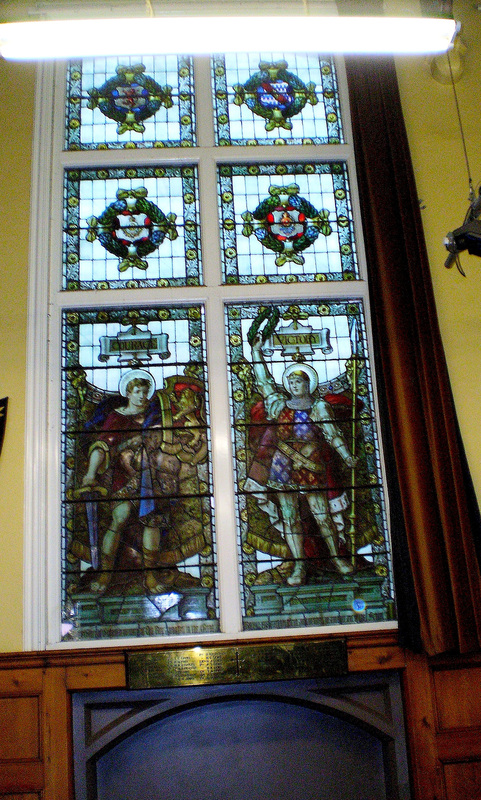 And exactly opposite the Memorial Window is the Roll of Honour. This has not changed either, nor have the matching door frames and panelling. I took this photograph standing in the doorway to the hall. You can see the main doors in the front of the school. A door to the right of those doors used to house the school library. Opposite that was a small room where my Six Arts form was housed. There was just about enough room for eight boys and a master. 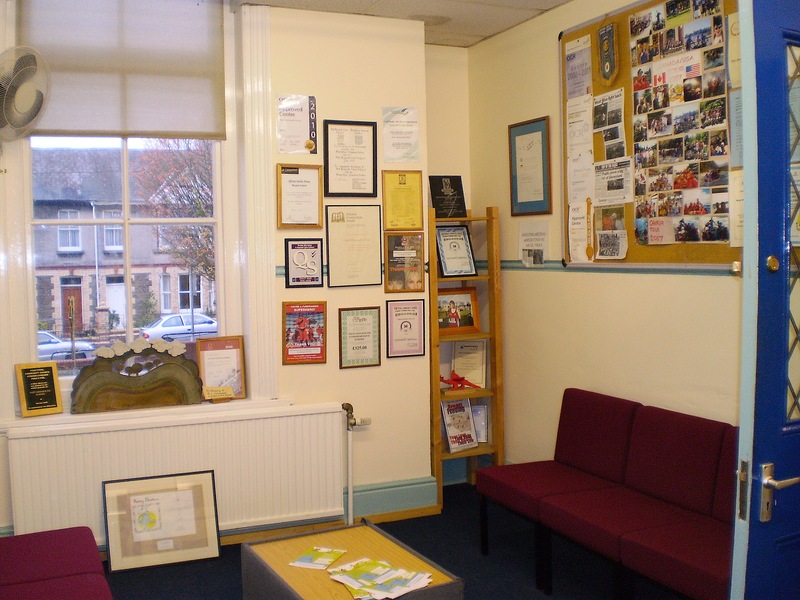 This is the room which is now the waiting room of the reception office which is to the left. My desk was to the right of the window and there were three rows of desks with very little space in between. 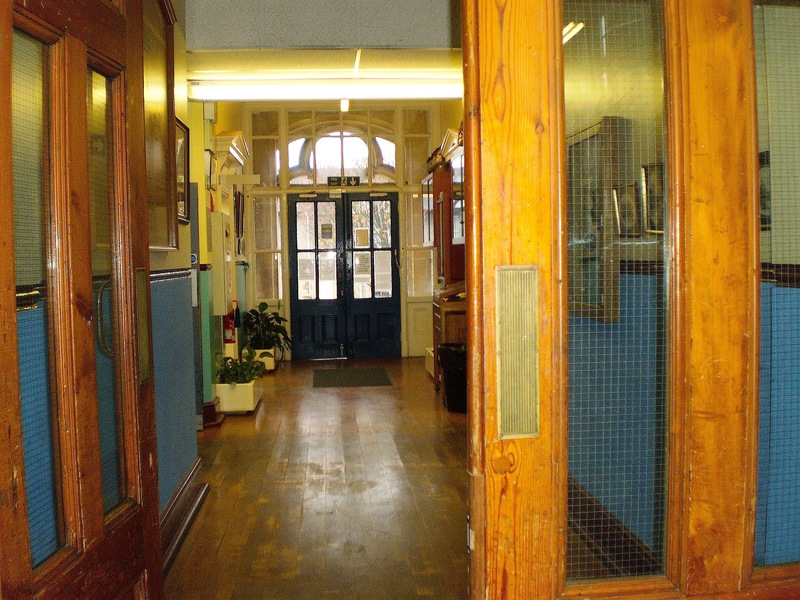 In this photo the main door is to the right and the hall door is to the left. 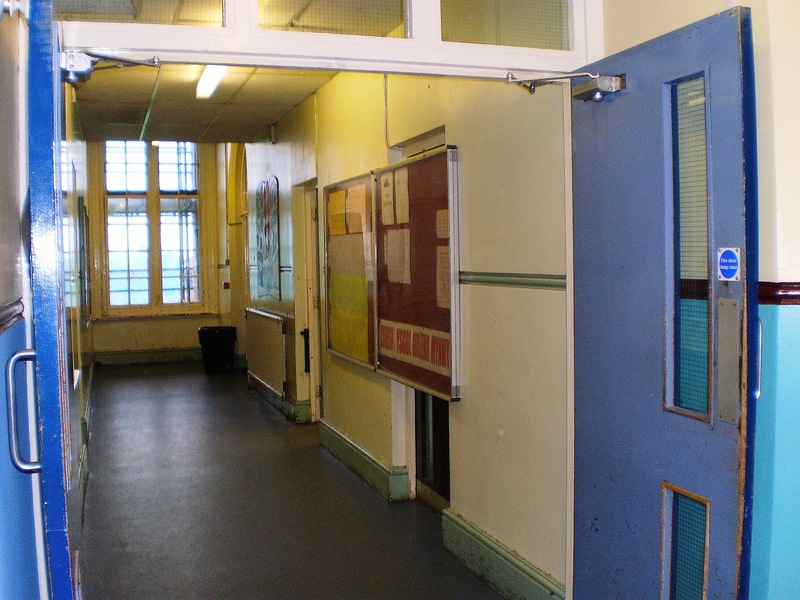 The large notice board blocking the door on the right is where the new Form One was established and which I refer to in a much earlier posting about the drowning tragedy in 1947. This might bring back memories for Peter Jeffereys of Ilfracombe. Opposite that door is the extra entrance into what was Form 3A in 1943. The blue fire-doors are a modern addition. That’s all the photographs I took on that day. I hope they are of interest to some visitors. Any comments will be welcome and, if there is any old West Mon boy living far away and would like to see some other part of the school, please contact me and, when I next visit, I can take some more photographs. Sports Day was the highlight of the year. For one thing it was a day off lessons. A lot of preparation was involved, not least of which was the marking out of the tracks around the sports field. Garnett used to take classes out of their normal lessons to do this job. Probably they would have learned a lot more from doing this than they ever would from one of Garnett’s lessons; as a teacher of anything other than rugby he was hopeless. The competition was between the school houses. There was a lot of cheering and shouted encouragement as the house heroes did their stuff. The heats took place first and then the finals. Points were awarded to the houses and the announcements of the points total were made at frequent intervals to the accompaniment of huge cheering from the house in the lead. There were the usual competitions: running of course in varying distances, throwing the javelin, putting the shot, throwing the cricket ball, and so on. Each house had its “experts” in all these events but occasionally they disappointed us. I remember one tall lad named Loughlin. 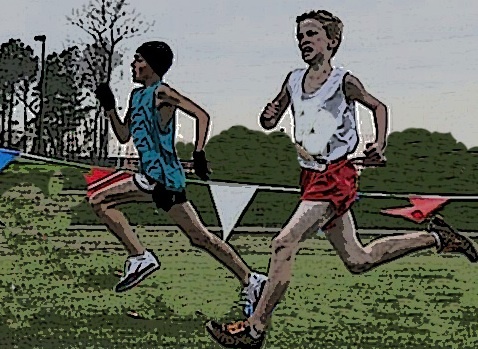 He was a very good runner but in one of his races he was beaten by a much smaller boy. The sports field was a reasonable size for the occasion and it’s a natural small amphitheatre with a bank running alongside with the terrace behind for overflow. The bank was always packed with spectators. Apart from points being awarded to the houses, each competitior was also awarded points and the boy with the most points became the Victor Ludorum which was always regarded as a great honour. It was invariably one of the older boys, often a prefect, who attained this dizzy height. 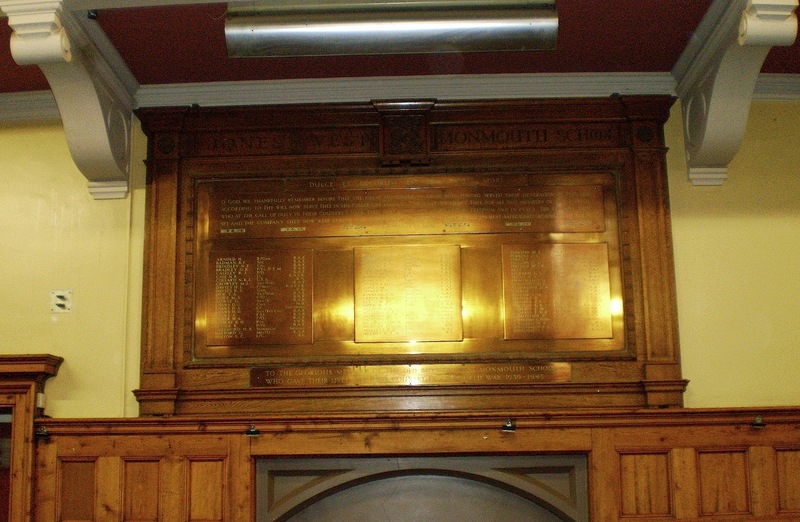 The icing on the cake for the Voctor Ludorum was to have his name painted on the Victor Ludorum honours board in the school hall for posterity. The group stared at each other dumbfounded for a few moments. It was Bunny, greatly excited by his sudden gift, who broke the silence. Titch was staring hard after the distant figure now getting fainter in the dim light. “I wonder why he did it?” he mused. “So’s Bunny could get a new ball of course,” stated Gogs simply, seeing nothing complicated in the situation at all. “We’d better collect all our gear before it gets dark,” said Miff. The boys walked away from the abbey ruins in the direction of their cricket gear which was just a grey heap in the quickly gathering dusk. Each took his own equipment and they walked slowly along the common away from the Straight Mile in the direction of the coast road which led to Bunny’s house. The other four noticed that Titch was very quiet as they walked along. He appeared to be deep in thought. “Why do you think he gave me the five pound note, Titch?” asked Bunny. “Yes, I suppose he did really,” admitted Bunny, half agreeing. “But he told us it was carefully hidden,” persisted Smudgie. “No, I suppose not,” agreed Smudgie who could see the sense in Titch’s argument. Smudgie and Gogs looked at each other with puzzled frowns. “Did you see him approaching, Smudgie?” asked Titch. “But why on earth should he have been down there?” asked Bunny. “Perhaps that’s where they’ve put their equipment,” suggested Miff. “Yes, and that’s why we didn’t see it,” said Gogs triumphantly with the air of one who has just solved a difficult problem. “But remember that man said they belonged to some London society or other and that they were going to investigate the abbey ghost. I call that a good reason,” returned Miff. “Mmmm . . . I suppose that’s true,” agreed Smudgie. By this time the boys had reached the entrance to the drive which led up to Bunny’s house. It was a large building standing in its own grounds and Mr Francis had bought it only a few months previously. Bunny led the way to the large greenhouse near the garden hedge. It was in here that the boys kept all their cricket gear. “Bernard! Is that you dear?” Bunny’s mother was calling from the back door of the house. “Come along then. It’s time to come in now,” she called. “Don’t tell them!” burst out Titch. 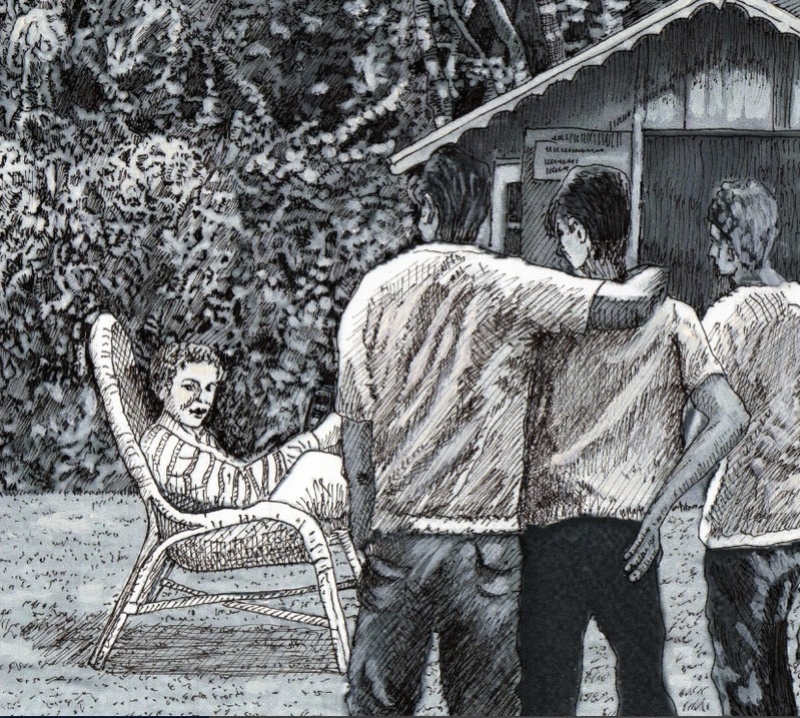 “Well,” said Titch in a low confidential voice, “I’ve been thinking.” The other four gathered round curiously. They knew that when Titch used that tone of voice he was going to say something interesting. “But what are we going to do?” asked Gogs quivering with expectation. The others mumbled their agreement.